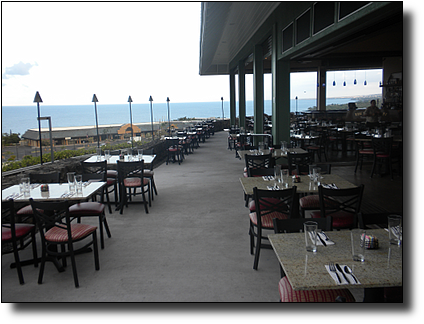 The 170 seat restaurant features both indoor and outdoor dining, a full bar and lounge seating, complete with fire pits. Guests may be accommodated in intimate groups of two or large parties and family gatherings. Guests may watch the fishing boats on the horizon and then enjoy the fresh, prized catch being served at their table. The view inspired the “The Short Bait” boat bar – a replica of a favorite boat often seen motoring out of local Honkohau Harbor. This fun, lively spot will be a great place to meet friends and listen to local fishermen tell their tales. 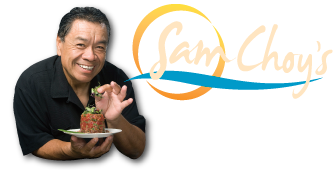 At the bar, enjoy Chef Sam’s famous shoyu poke, baby back ribs or calamari steak with an Island Sangria, cocktail, a glass of wine or one of our signature craft cocktails. Call your order in ahead and just stop by to conveniently bring Chef’s Choy’s delicious meals home with you…breakfast, lunch and dinner!